Joshua Langston-White went to college for two years after high school, but was looking for something else in life. He found it in the Marine Corps as an Infantryman, serving with 1st Battalion, 1st Marines. His father was a Marine, and that motivated Josh. On Aug. 10, 2012, Corporal Langston-White was on his first deployment when he was injured by an improvised explosive device (IED) in Helmand Province, Afghanistan. The blast resulted in the loss of both his legs above the knee. 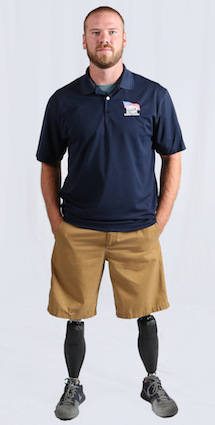 After undergoing 13 surgeries and a year and a half of recovery, Joshua is now back in his home state of Florida where he works for Citrus United Way running the Veteran service program Mission United. He enjoys playing golf and any activity involving water – fishing, swimming, and tubing. As of now, he is more focused on his wife Brittni and their son Parker who was born in December 2017. Although he has made progress in his recovery, Joshua still struggled with daily activities in is previous home. Even small tasks such as carrying in groceries from outdoors were a challenge because he had to step over a curb. In the home, there were more hazards including narrow doorways, high shelves, and inaccessible appliances. Receiving a specially adapted custom home from Homes For Our Troops on a level lot, with an open floor plan, automatic doors, and roll-under sinks makes it easier for Joshua to perform routine activities. Joshua is most looking forward to raising his family with Brittni. He says knowing he will a have a home adapted to his injuries, where he can live safely, provides a great comfort to him. “The home is where you teach your kids everything,” he says. Joshua chose to build his home in Florida because he has family and a support system there.